*This is a repost in light of a recent message I taught on this subject. I'll never divorce my wife because I love her. I'll never divorce my wife because I love my four children. I'll never divorce my wife because I love God. Staying married, therefore, is not mainly about staying in love. It is about keeping covenant. “Till death do us part” or “As long as we both shall live” is a sacred covenant promise—the same kind Jesus made with his bride when he died for her. 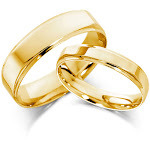 Therefore, what makes divorce and remarriage so horrific in God’s eyes is not merely that it involves covenant-breaking to the spouse, but that it involves misrepresenting Christ and his covenant. Christ will never leave his wife. Ever. There may be times of painful distance and tragic backsliding on our part. But Christ keeps his covenant forever. Marriage is a display of that! That is the ultimate thing we can say about it. It puts the glory of Christ’s covenant-keeping love on display. The most important implication of this conclusion is that keeping covenant with our spouse is as important as telling the truth about God’s covenant with us in Jesus Christ. Marriage is not mainly about being or staying in love. It’s mainly about telling the truth with our lives. It’s about portraying something true about Jesus Christ and the way he relates to his people. It is about showing in real life the glory of the gospel. Jesus died for sinners. He forged a covenant in the white-hot heat of his suffering in our place. He made an imperfect bride his own with the price of his blood and covered her with the garments of his own righteousness. He said, “I am with you . . . to the end of the age. . . . I will never leave you nor forsake you” (Matt. 28:20; Heb. 13:5). Marriage is meant by God to put that gospel reality on display in the world. That is why we are married. That is why all married people are married, even when they don’t know and embrace this gospel. I'll never leave my wife because I love the Gospel! It's true that our lives and our words and our actions and our relationships are all means by which we can display the Gospel to the lost world, but it is our marriage and ONLY our marriage that is designed by God to be THE perfect illustration of the amazing and permanent love that Christ has for His Bride. Of course, our marriages aren't perfect because we aren't perfect. In fact, if you have an imperfect marriage (and we all do), what better way to show the world how God loves sinners than to have two sinners in a marriage showing that same love to one another. One HEARTY "Amen" to this. My prayer is for my husband to realize that regardless of our problems that if God is in the center of our lives that we can have the kind of love that overcome anything...Please pray that God will help us find this somehow before we decide to give up on our 16 yrs together. God can make the impossible possible.